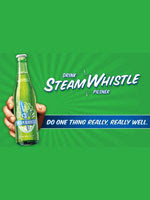 To celebrate Father’s Day, Steam Whistle Brewing once again offers FREE Brewery Tours for Dear Old Dad on Sunday June 19TH, 2011. The Brewery’s onsite Retail Store is open from 11am to 5pm on Sundays with tours running every half hour beginning at 1pm with the last tour at 4pm. Bring your father into the brewery and Dad will receive the tour, complimentary samples of Canada’s Premium Pilsner and a souvenir glass or opener. Reservations are not accepted on weekends as tour groups are filled on a first-come-first-served basis, but waiting for the next tour group is pleasant. Visitors can enjoy a free sample of Steam Whistle Pilsner and can take in the local art shows on exhibition here. The Brewery’s art gallery is featuring a mixed media painting exhibition for the month of June.